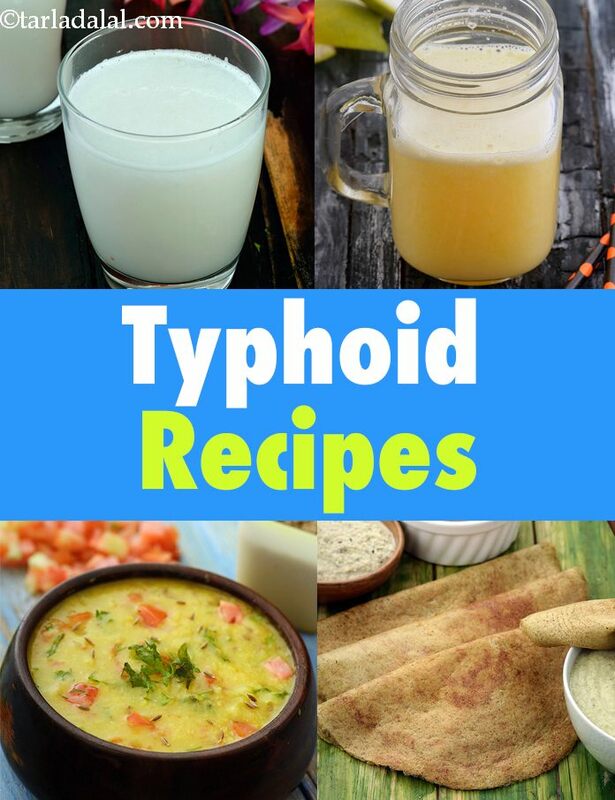 Healthy typhoid recipes, Indian typhoid diet. Typhoid is a type of fever caused by bacteria called Salmonella typhi, which spreads through water and food. Typhoid is associated with symptoms like poor appetite, headache, lethargy, general pain, diarrhoea and gastric discomfort. Diet plays a major role in the proper cure of typhoid. Drugs alone cannot help unless you follow the recommended diet. The diet should be progressive, moving from liquid diet to a soft diet and eventually a normal diet depending upon the individual’s food tolerance level. You need to avoid fried, junk foods, and follow some general pointers. 1. Since your appetite will be low, go for calorie-dense foods that are low in fibre. We suggest the Moong Dal Dosa recipe. 2. An increase in the body’s metabolic rate causes tissue breakdown. So, you need to opt for foods with sufficient protein, such as the Wholesome Khichdi. 3. Prefer to eat freshly cooked meals rather than raw foods and salads. 4. Always remember to eat small and frequent meals. 5. Avoid drinking water during meals, because it will make you feel fuller and you will refrain from eating food. 6. Tolerance to milk and other dairy products is very individualistic. Check with a smaller quantity and continue only if it suits you. If you have diarrhoea, it is better to avoid dairy products. 1. High fibre foods like whole grain flours like jowar, ragi, whole wheat flour, bran flakes, broccoli, peas, beans, whole pulses, pear and other fruits with skin etc. 2. Gas-forming foods like cabbage, broccoli, cauliflower, radish, turnips, whole pulses like chick pea etc. 3. Highly-seasoned foods like spicy chaats, sizzlers, curries, gravies, chutneys, pickles, pulaos and biryanis, and seasonings like oregano, thyme and chili flakes. These tend to irritate the digestive tract. 4. Junk foods like pasta, pizzas, burgers, French fries etc. beginning from a liquid diet, slowly graduating to a semi-solid diet and then a normal diet. 1. Liquid Diet – When suffering from typhoid, it is very important to stay hydrated because there is a lot of water loss due to diarrhoea. You need to consume 3 to 4 litres of fluids daily to flush out the toxins through urine. Apart from water, fluids can be taken in the form of fruit juices like Pineapple, Apple and Cucumber Juice, buttermilk, soups, barley water Coconut Water with Coconut Meat etc. Go for soupy meals, which will give you enough proteins and also keep you satiated. 2. Semi-Solid Diet - As your appetite gets better, you should include semi-solid foods like banana, boiled rice, baked potato, boiled eggs, stewed or baked apple etc. When there is no fever, you can include other fruits and boiled vegetables too. 3. Normal Diet - As you recover and feel alright, you can start including yoghurt and eggs Fried Egg because these are easily digestible and provide good quality proteins. Enjoy a glass of chaas. Vegetarians can obtain protein from dals and paneer. Explore the sub-categories of this section online to find out what kind of juices, soups, protein-rich, low-fibre foods you can have. Also discover some interesting breakfast and snack options that will help you heal and recuperate.